Thanks for Entering Our Contest! Great Ideas For A Back Splash! Adding tile, stone or metal to a back splash can make a major change in the look of any kitchen. Adding your own flare with deco’s, borders and patterns will make it uniquely your own. You can mix and match materials, tiles, colors and sizes to make all sorts of fun designs. Here we added a pencil above the first row and then did the top on a diagonal. Between the stove and microwave. 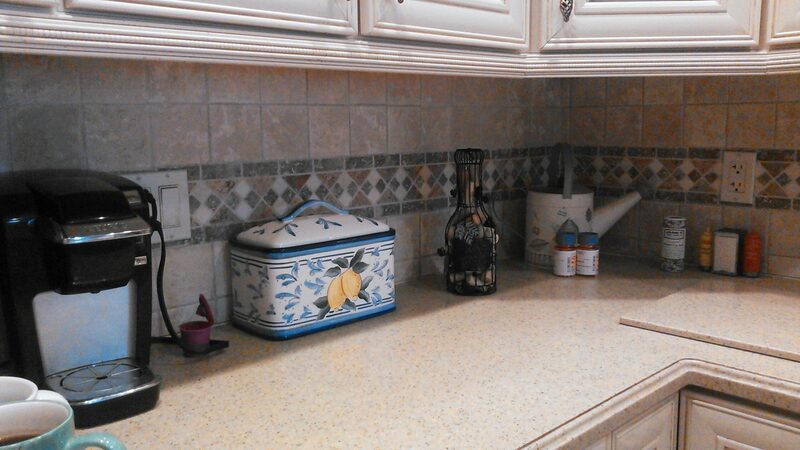 Here we used glass tile to blend with the granite countertop. Glass tile used for the back splash. Head over to the Next Page to for a video on How to Install Back Splash Tile. Don’t Trash Old Cordless Tool Batteries. The Magic of Floating Shelves. Want to Make These? Prepping Lawn Equipment For Storage! PeekandPick Shop on Before Calling a Service Man, Check These First.